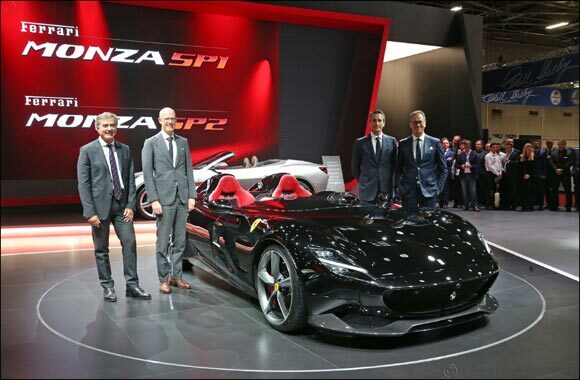 Dubai, UAE, October 03, 2018: The Ferrari Monza SP1 and SP2 are the forerunners in a new concept, known as ‘Icona’ (Icon), that taps into a leitmotif of the most evocative cars in the company’s history to create a new segment of special limited series cars for clients and collectors. The intention is to use a modern aesthetic to reinterpret a timeless style, with technologically advanced components and the highest performance possible through continuous innovation. Enzo Ferrari used to say that “If there is such a thing as a soul, engines have one”. This model’s soul is, as is true of all Ferraris, in its engine. The Ferrari Monza SP1 and SP2 are equipped with the most powerful naturally-aspirated V12 ever produced by Ferrari. Thanks to specific areas of development, the power of the 812 Superfast’s 6.5 litre has been increased by 10 cv to 810 cv at 8500 rpm with a slight increase in torque to 719 Nm at 7000 rpm. As these are completely en plein air sports cars with no windscreen, one of the biggest challenges was to create an aerodynamic solution that would ensure the driver enjoys the performance of the cars without being affected by issues caused by the barchetta configuration. The result was the patented “Virtual Wind Shield” which is integrated into the fairing ahead of the instrument panel and the steering wheel, providing exceptional driving comfort. Racing has always greatly influenced Ferrari design language and the Monza SP1 and SP2 are linked to the marque’s glorious past by an invisible bond. Their design, in fact, embodies the elegance, performance and innovation that are such an intrinsic part of Ferrari’s past and present. From the point of view of pure creativity, the seductive images of 1950s Ferrari barchettas, that evoke in so many ways the atmosphere of the races of the day, were an invaluable source of inspiration. The Ferrari Styling Centre’s designers gave the barchetta concept an absolutely modern connotation thanks a new and highly personal take on the theme. But there are no nostalgic references, no elements borrowed directly from the past. The Monza SP1 and SP2 were designed like a modern single-seater for a new generation of gentlemen drivers. The Monza SP1 and SP2 design language is clearly visible in its elegant forms and the wing-profile volume of the all-carbon-fibre bodyshell, in its proportions, refined details, spare lines. The extreme forms of the more extreme high-performance Ferraris have been avoided. In this instance, the Ferrari Styling Centre’s designers strove to retain a form so pure it could be described in a single pencil stroke. The cars’ sleek, minimalist silhouette seems almost to float on the delicate yet robust sculptural rear diffuser that wraps around the tail like an embrace, visually leading to the slender yet precise line of the flanks and then to the base of the front bumper. That effect is further amplified by the colour contrast between the black carbon-fibre of the sills and the rest of bodywork, the extreme lightness of which is underscored by the two elegant shells comprising it. The Monza SP1 and SP2’s postmodern aesthetic is also clear at the rear which has the soft, sinuous look typical of the Ferraris of the 1950s, a compact tail and full, muscular forms. The pivotal idea was to break up the volume into two shells: an upper cover and a lower hull. These two elements create a dialogue yet the upper shell seems almost to float, an effect obtained by a an uninterrupted strip inside a groove that circles the cockpit and ends above the tail. This solution creates the impression that the two volumes are separate. This is a theme which appeared on Ferraris of various different decades, including those from the 1980s, but in this instance also became a leitmotif that brings structure to the form. It allows the rear of the car to be both solid and light at once. The interesting thing in this case is that it allowed a new tail light concept to be introduced: the side lights and brake lights have been redesigned as a single unbroken line of light, seamlessly integrated into the slender gap between the two shells. This turns the tail light assembly into a theoretical line that traverses the wings and circles the bonnet, giving the impression that the upper shell is literally suspended above the rest of the volume. This is a very contemporary take on the rear-end treatment of the 750 Monza and 375 MM which provided the inspiration. This iconic theme of the “line of light” resurfaces in the headlights too and along the side air vents creating a signature “naked” effect. The cars’ flanks are absolutely clean, taut and pure, interrupted only by the visually striking, scooped side air vent, in homage to the barchettas of old. The front of the car is sober and spare: a single smooth, pared-back surface seamlessly integrating bonnet and sinuous wings. Its forms are a nod to the signature styling elements from Ferrari tradition. It is a fuselage extending back from the fine mesh radiator grille which itself is underscored by the three-dimensional structure beneath it with its two prominent air intakes. The entire front of the car looks as if it is draped, cloaked and enveloped by the surface treatment. Particular attention was lavished on the design of the compact doors which open upwards. This involved re-engineering the 812 Superfast’s entire door assembly but the results are spectacular. Equally important is the all-carbon-fibre one-piece bonnet-wing assembly which is hinged at the front to showcase the imposing V12 engine once open. The exterior is completed by wonderfully sculptural 21” five-spoke wheels that were designed specifically to compliment the minimalist lines of the two cars. Another iconic theme is, of course, the livery designed for the Monza SP1 on display at the Paris Motor Show. This was inspired by the geometry and graphics of the liveries of Ferrari’s historic racing cars - the 250 GTO, 250 Testa Rossa, to name but a few icons. The result is a stripe across the bonnet which underscores the proportions of the latter and the wings, with the same theme picked up again on the driver’s roll-hoop buttress at the rear. The development of the design of the interior focused specifically on the driver cockpit. The ergonomics were crafted by concentrating on all the interior content which were redesigned to match the car’s unique purpose. The instruments, instrument cluster and seat structure needed a functional rethink to meet the driver’s new requirements, one that would also retain a consistency of stylistic language with the exterior and the underlying design philosophy. Starting with a drop theme in the form of an obvious ring on the tonneau cover, the interior architecture splits into three levels. The first is delineated by the driver’s visual horizon. From that perspective, the line between the car’s interior and exterior is very subtle indeed. The driver’s body is entirely encapsulated by the car apart from their head which juts out over the horizon line, as in racing cars, thus reducing visual distractions of all kinds. The second level comprises the instrumentation, steering wheel and air vents. Lastly, the spare cockpit embraces, at armrest level, the rest of the commands which are clustered on a single very simple surface completely devoid of any stylistic virtuosity. The carbon-fibre single-piece seat is upholstered in leather and lends the inside of the car an exquisitely tailored look, as do the very few other areas of leather upholstery which are carefully positioned to guarantee maximum comfort when driving. The engine in the Monza SP1 and SP2 is derived directly from that of the 812 Superfast, with optimised fluid-dynamics in the intake ducts to deliver even higher performance. The V12, which was recognized as the best engine over 4 litres and the Best New Engine at the 2018 International Engine of the Year Awards, brought in a number of innovative solutions. Amongst these is a 350 bar direct injection system for the very first time on a high-performance petrol engine paired with variable geometry intake tracts conceptually derived from those of naturally-aspirated F1 engines. In terms of longitudinal and lateral performance, the car’s architecture is unique because of the complete absence of both windscreen and roof, yielding different aerodynamics. As a result, the goal for its longitudinal and lateral performance was to meet and, if possible, improve on the 812 Superfast’s performance. The result is that the Monza SP1 and SP2 share the excellent acceleration characteristics (0-100 km/h in 2.9 sec and 0-200 in 7.9 sec) and braking performance (100-0 km/h in 32 m) of the 812 Superfast and only lose a little in maximum speed (over 300 km/h). In order to achieve the goals set, the Virtual Short Wheelbase concept debuted on the F12tdf and then later also adopted on the 812 Superfast was maintained, as was the Electric Power Steering (EPS). The larger 21” forged rims required bigger tyres - 275/30 at the front and 315/30 at the rear – and the suspension set up is slightly stiffer to improve the feeling of agility and the response time to commands. As with all Ferraris, the design of the Monza SP1 and SP2 was crafted around the aerodynamics required to immerse the driver fully in the car’s impressive performance. The Virtual Wind Shield was patented for this car in response to the need to allow the driver enjoy it at high speeds. Although it remains below the driver’s cone of vision, it delivers maximum driving comfort for a barchetta, both in terms of historic car benchmarks and models with similar architecture. The concept was first developed virtually using in-depth CFD modelling and then physically in the wind tunnel. A full-scale mock-up was built specifically for the Wind Tunnel in which our test-drivers alternated with dummies fitted out with pressure sensors (rake and keel probes). Because of the extreme nature of the car, the support of the test-drivers and their experience was vital both in the initial phase of defining the target and the final validation stage of the overall package. Instrumented dummies and computations, on the other hand, gave our engineers an in-depth understanding of the aerodynamic phenomena that need to be managed and also allowed us to increase the critical mass of the solutions tested. With no windscreen whatsoever, the air flowing over the bonnet would hit the driver’s face. The aim with adopting the Virtual Wind Shield was to minimise the negative effect of the air flow without compromising the exhilarating sense of speed and contact with the road that only a car of this kind can deliver. The Virtual Wind Shield is essentially an aerodynamic passage underneath the driver’s side aero screen, where the upper part is shaped as an aerofoil. Part of the air flowing over the bonnet enters the air intake under the aero screen, where it is accelerated and deflected vertically ahead of the instrument panel. It is aided in doing so by the nolder on the aero screen itself which creates strong suction thereby accelerating the air coming out of the duct beneath the wind shield. This generates what is known as a highly energised upwash that deflects the flow over the driver’s head creating a low-speed bubble around the cockpit. Inside the Virtual Wind Shield duct are two divergent fences. These two fences create a pressure variation between the central channel and the outer channels of the duct which minimises fluctuation in the flow field at the outer edge of the low speed bubble around the driver. This in turn reduces aerodynamic noise and boosts overall comfort by eliminating the risk of dangerous oscillations in the transverse aerodynamic forces around the driver’s head. To communicate the feeling of being directly connected to history, Ferrari collaborated with two luxury companies of excellence, Loro Piana and Berluti, on creating a selection of apparel and accessories especially for Monza SP1 and SP2 clients. Ferrari worked with Loro Piana to produce items of clothing to enhance the unique driving pleasure afforded by these two cars. The apparel was inspired by the elegant 1950s, a time when Mike Hawthorn always insisted on driving in a bow tie and Marzotto won the Mille Miglia in a double-breasted suit. Inspiration from the past that has produced a comfortable yet range of clothing. Inspired by the design of the Ferrari Monza SP1 and SP2, a set of driver’s overalls comprising trousers and bomber jacket are made from “rain storm techno wool stretch” fabric which protects the driver from the elements yet allows complete freedom of movement. The suit closes securely to offer complete protection from the wind but can also be worn with the lapels opened back on the wearer’s chest, instantly conjuring up the imagine of a sophisticated sports jacket. Exclusive extra fine merino wool is used for the driver’s overalls, but it has been treated with Storm System® to make it water-resistant and windproof – perfect for driving at speed. Ferrari worked closely with Loro Piana creating a seamless yet uncompromising interpretation in textiles of both styling elements and colours. Rosso Corsa provides a vivid contrast with carbon-fibre-inspired dark grey while the cars’ sinuous lines are reflected in the cut of the garments also, overlapping and running effortlessly through the bomber jacket, sweater and trousers. The predominantly diagonal motifs are sporty and borrowed heavily from carbon-fibre. Inside the jacket, there is also a highly distinctive Ferrari styling reference: the engine and identification plate for each car personalised with the number of the car. A patch on the belt can also be personalised with the owner’s name or monogram as a further personalisation flourish. The sweater is made from highly select ultrafine 15.5 micron Wish® merino wool. Soft, light and warm, it is designed to be extremely comfortable without creating any unnecessary bulk under the driver suit. The high collar is zipped for warmth but the zip is carefully concealed to keep the lines as clean and neat as possible. In case of rain, there is a cap: traditional elegance given a modern take using water and wind-resistant technical wool with a wool piqué lining. The cap is elasticated at the back for a perfect and very comfortable fit that never feels tight. The range of apparel is completed by the scarf in Wish® wool with a diagonal structure and contrasting selvage, and gloves in incredibly soft and unlined plongé leather for optimum feeling at the steering wheel. Ferrari also worked with Berluti, a leading luxury footwear and leather goods brand, to produce other unique and innovative products Ferrari Monza SP1 and SP2 owners. A helmet was developed specifically to provide owners with the comfort and safety demanded in a barchetta-style car. Made from carbon-fibre, the helmet is instantly recognisable thanks to inserts in leather which have been subject to Berluti’s unmistakable treatment making this a genuinely exclusive item. To carry the helmet and apparel owners will also receive two Berluti bags, both exclusively designed for this iconic car with clear references to Ferrari’s Rosso Corsa colour and the cars’ forms. Lastly, a special lace-up Oxford driving shoe was developed. Available in Graphite black or Brun, it’s made of Venezia leather and features hidden laces and red piping on the heel. The special sole was designed using the same carbon-fiber fabric used by Ferrari for its cars. Ferrari’s unparalleled quality standards and growing focus on client service underpin the extended seven-year maintenance programme that is also offered with the Monza SP1 and SP2. Available across the entire range, it covers all regular maintenance for the first seven years of the car’s life. The scheduled maintenance programme for Ferraris is an exclusive service that allows clients the certainty that their car is being kept at peak performance and safety over the years. This very special service is also available to owners of pre-owned Ferraris. Regular maintenance (at intervals of either 20,000 km or once a year with no mileage restrictions), original spares and meticulous checks by staff trained directly at the Ferrari Training Centre in Maranello using the most modern diagnostic tools are just some of the advantages of the Genuine Maintenance Programme. The service is available on all markets worldwide and from all Dealerships on the Official Dealership Network.